Producer Sessions Live is a weekend celebration of unique masterclasses by a roster of top names in electronic music brought to you by Future Music and Computer Music magazines. The event is taking place at the amazing SAE school in London on 25 and 26 September and we've got every great gear company in the world appearing for one-on-one product demos and a host of top producers appearing live for intimate tuition sessions. Tickets for each day are just £8, with each Producer Session costing an additional £4. The latest news is that we now have a final lineup of producer's taking part. The two new additions are James Hockley of Chicane and top producer Steve Mac, who join an already star studded lineup featuring Freemasons, Dave Spoon, Danny Byrd, Jon Carter & Alex Blanco, Tommy D, London Elektricity and Sharooz. All of the guys will be hosting their own exclusive Producer Session at the event. Room at each session is limited so be sure to book your place now. STOP PRESS: Freemasons and Dave Spoon's Saturday slot are already sold out. Joining the guys will be rooms dedicated to demos of all the latest gear and we're proud to announce the final lineup of exhibitors is Apple, Akai, Avid, Alesis, Ableton, Absolute, Cakewalk, Digidesign, Event, Eventide, Focal, Fostex, FXpansion, Genelec, Jamhub, Novation, Korg, Lynx, Moog, M-Audio, MOTU, MXL, Numark, PreSonus, Roland, ReBEAT, Propellerheads, Pro Tools, Spectrasonics, Steinberg, Tascam, Time & Space, Toontrack, Sample Magic, Sontronics, sE, SSL, SoundCloud and Universal Audio. Plus, thanks to our friends at Ministry of Sound all Producer Sessions ticket holders can get into the clubfor free on Saturday 25 September. Simply show your PSL ticket on arrival. 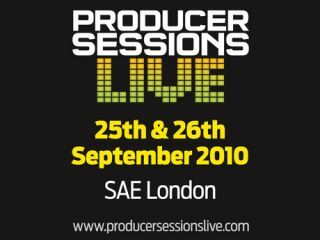 To book your tickets head to www.producersessionslive.com now.